The Table Mountain Veterinary Clinic team of skilled veterinarians welcomes you to our practice. Proudly serving the Golden area. At Table Mountain Veterinary Clinic, it is our daily privilege to provide quality vet care to your cherished pet, with compassion and competence. We hope to ensure a positive impact on our patients, pet owners and the local community. Dr. Donna Valori, a 1985 graduate from Colorado State University, joined the practice in 1987. 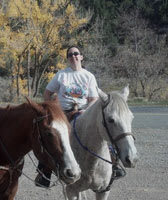 She enjoys skiing, hiking (including fourteeners) with her dogs Sparrow and Levi. In addition to working full-time at our main clinic in Golden, Dr. Valori also sees patients at our satellite clinic in Coal Creek on Monday and Wednesday evenings. Her empathetic touch and wide veterinary interests keep our clinic flexible. 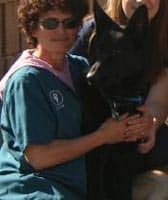 Dr. Janelle Morton DVM graduated from Colorado State University as a DVM in 1998. 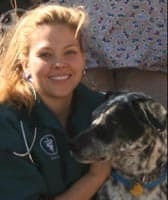 Before she joined our team she practiced at a small animal clinic in Littleton, Colorado for about 10 years. She started with us here at TMVC in April of 2008. The clients feel she is very thorough and compassionate toward their animals and their needs. Besides bringing a caring heart for our furry friends, she also enjoys diving in various countries, scrapbooking and camping with her husband, two children and dog Petey. Dr. Catherine Roberts graduated from Ross University School of Veterinary Medicine in 1996. Before moving to Colorado, she practiced in upstate New York for over 15 years as a full-time, part-time and relief veterinarian. Since relocating to Colorado, Dr. Roberts has been settling into married life with her new husband, John, their redbone coonhound, Annie and enjoying traveling and seeing the beautiful sights of her new home state. She is excited to be starting her position at TMVC and is looking forward to getting to know her new clients and patients. Please join us in welcoming Dr. Kaitlyn Hart Table Mountain Veterinary Clinic! Dr. Hart comes to us from a large veterinary hospital in Oklahoma. She graduated from Oklahoma State University in 2015 and has been in practice there since. It has always been her dream to make Colorado her home. She enjoys all things outdoors and is excited for this new adventure with her two cats, Everest and Gatsby. We are excited for her to begin her journey here at Table Mountain, and are confident you will feel immediately comfortable with her compassionate approach to your pet’s care, and with the medical skills she brings to our practice. She has a passion for both preventative veterinary care and complicated cases, and has experience in both dentistry and surgery. She looks forward to meeting you and your pet family! 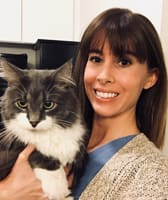 Dr. Krystal Robinson came to us as a veterinarian in April of 2019. She previously worked at Table Mountain Veterinary Clinic for 15 years, two of which were spent as a kennel technician and the other 13 as a veterinary technician. She left us in 2014 to go to Veterinary School at Saint Georges University in Grenada. She did three years in Grenada and then her clinical year was spent in Alabama at Auburn University She graduated and received her DVM from Saint Georges University in January of 2019. Dr. Robinson is a Colorado native, and her interests within the field are internal medicine, patient care and good client communication. Dr. Robinson has one dog named Lola that she adopted as a Good Sam from Auburn University (pictured above). Her other interests include photography, camping, spending time with family and friends and Denver Broncos football! We very much look forward to you and your pets meeting Dr. Robinson, unless they already have, since she has been in our family at TMVC for so long!